The chrome plated Neo minimalist bath taps with slider rail kit; featuring sleek lines and a square design, the neo tap is the perfect modern fixture for any bathroom. The Neo Bath Shower Mixer Taps comes with a easy clean square handheld shower head, slide rail and flexible hose. "Good quality shower and taps, solid feel. Need fitting soon, hope it will all work well." Great. Really upgraded my shabby old bathroom! Well made and does the job. Looks brilliant too. 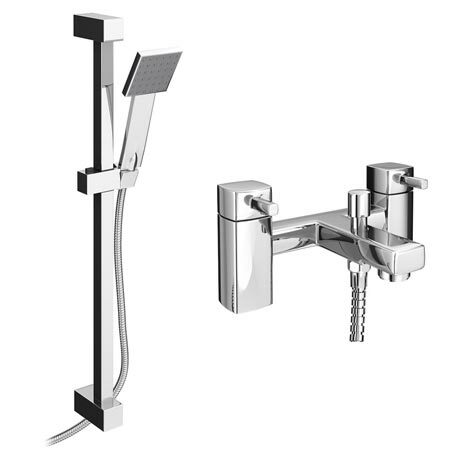 "Bought to replace a leaking bath mixer tap with shower connection this unit seems like good quality, it is quite stylish and it was easy to install. So far, I am happy." Very easy to fit on and works perfectly. "Just what I was looking for, cheaper than anywhere else." Perfect to go with my new bath. Good quality.